TORONTO — David Pastrnak continues to terrorize the Toronto Maple Leafs. The Boston winger snapped a 2-2 tie late in the second period as the Bruins defeated Toronto 3-2 on Saturday night. Sean Kuraly, with a goal and two assists, and David Krejci also scored for Boston (26-15-4), which eliminated the Leafs in seven games in the first round of last season’s playoffs. Tuukka Rask made 30 saves as the Bruins won the season series between the teams 3-1 and now sit just two points back of the Leafs for second in the Atlantic Division. Mitch Marner and Andreas Johnsson replied for Toronto (28-14-2), which does have a game in hand on Boston. Michael Hutchinson stopped 26 shots. The Bruins beat the Leafs 5-1 at home on Nov. 10 before Toronto returned the favour 16 days later with a 4-2 victory at Scotiabank Arena to set up a testy affair featuring 98 minutes in penalties that Boston won 6-3 on Dec. 8. Kuraly intercepted a soft pass behind the net by Leafs defenceman Nikita Zaitsev before feeding Pastrnak, who buried his 26th goal of the season past a surprised Hutchinson with 13.7 seconds left in the middle period. 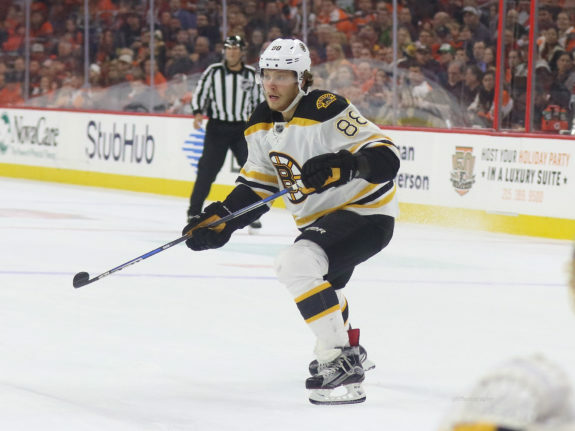 Pastrnak now has 19 points (11 goals, eight assists) in 15 career regular-season games against Toronto — including six goals and three assists in four outings this season — after scoring five times and setting up eight others against the Leafs in last spring’s playoffs. Hutchinson scrambled to stop a Pastrnak chance early in the third to keep his team in it before Nazem Kadri missed the net from a difficult angle at the other end midway through the period. Auston Matthews had an excellent opportunity to tie with four minutes to go, but shovelled a backhand wide with Rask at his mercy. Toronto pressed late with an extra attacker only to see Boston hold on. Boston led 1-0 after the first, but the Leafs got even at 7:37 of the second on a strange play. Johnsson’s quick shot went off Rask, off Bruins defenceman Kevan Miller, who was battling Matthews in front, and dribbled into the Boston net for the winger’s 10th. Toronto’s dormant power play — 1 for 36 over its last 13 game when removing a 3-for-3 effort against Florida on Dec. 20 — came to life 1:53 later to give the Leafs their first lead when Marner blasted a slapshot shortside on Rask for his 17th. But the visitors got even on another gaffe by a Leafs blue-liner at 14:47 when Jake Gardiner fanned on a breakout pass before having the puck stolen by Chris Wagner, who fed Kuraly in the slot to snap home his fifth. Hutchinson, who spent three seasons in the minors with the Bruins after getting drafted 77th overall in 2008, got his fifth straight start for Toronto with No. 1 netminder Frederik Andersen — on the shelf since Dec. 28 with a groin injury — out with the flu and backup Garret Sparks still recovering from a concussion. Krejci opened the scoring with 1:39 left in the first period where Toronto carried the balance of play after an early Boston surge. Kuraly turned back in the offensive zone and fed Krejci, who made no mistake past Hutchinson for his ninth. 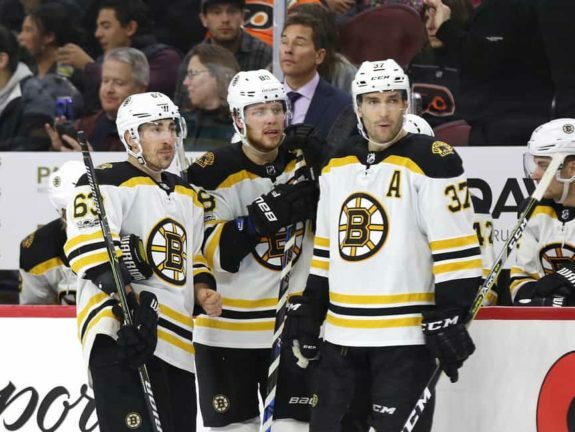 The Bruins had two golden opportunities to take the lead early, but Marchand missed a wide-open net inside the game’s first minute before Bergeron fired wide on a 2-on-1 moments later. Kasperi Kapanen had another great chance for Toronto prior to Krejci’s opener, but Bruins defenceman Matt Grzelcyk blocked his effort at a yawning Boston cage with Rask out of position. Notes: Charlie McAvoy, who missed 20 games with a concussion earlier this season, returned to the Bruins lineup after missing the last seven with a foot injury. Boston had its top-6 blue-line corps dressed together for the first time this season. Pastrnak and Krejci are the only players on the roster to play in each of their team’s 45 games this season. … Canadian astronaut Chris Hadfield was in attendance. … The Leafs host Colorado on Monday, while the Bruins are home to Montreal.